Blognonymous : Honesty Is Not Always The Best Policy. Right? 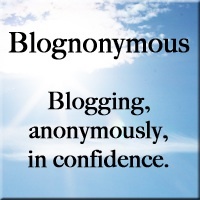 Editors note: This post was submitted to me to within the ethos of Blognonymous. The writer would like to remain completely anonymous and is grateful for this "get it all off your chest" opportunity. Please feel free to comment on this post and offer your advice or thoughts. So when your mother (through your father as her mouthpiece while she lies there catatonically staring at the ceiling) asks you why you hate her, it is best to lie? Right? Even if dislike is not exactly hate, I guess dislike is close enough. I have been tortured by my feelings because she is my mother. I was taught that honoring your father and mother is something that should be aspired to and I feel awful and like a really lousy person for not being able to get past it. I am just not willing to accept a negative personality who is resistant to change and weighs me down. I don't want to hear all the time what I need to change or what I am doing wrong. And if I am truthful, I am at times worried for the safety of my kids, particularly the little ones. I am also uncomfortable exposing my kids to her kind of underhanded insidious poison. Don't get me wrong. I don't think she is a bad person. I think she has had many challenges in her life and feels that life is passing her by. I also think that instead of looking deep into herself and trying to figure out why all her children have this kind of relationship with her, she again puts the blame on us. Not in an outright manner, but with a comment here and there. Hmmm, three of us with all different types of lifestyles yet we are all the ones that are wrong and need changing. Is it any wonder we all live thousands of miles away? Grow up. Please. Get help. The short period of time a few years ago that you were on Prozac, you were a different person. Almost pleasant to be around. Take the first step and admit that you need help, that you could use some serious counseling and from professionals and not just friends. You don't know everything, even though you insist that you know better than doctors, better than other professionals, better than most everyone. Try to be conscious of other people. I get that like a child misbehaving so he can get his parents' attention you don't know how to get affection so you do annoying things. Or maybe you are just so used to being on your own that you don't realize it is annoying. What I do know is that a relationship is something that needs to be worked at and affection earned. To get respect you need to treat others with respect and respect their wishes in their own houses. When you don't make your children or grandchildren your priority, your life looks like and lacks things accordingly. And paying lip service and insisting you do put them first means nothing when it is only words and no action. You seem to have or find money for all kinds of other things, but to get on a plane to see your grandkids takes a back seat. Get a part time job, save up for the trip if you have to. To go years without seeing your growing grandkids is a pity, mostly for you. Because you are the one who is losing out the most. The kids have other people present in their lives who love them and by whom they feel loved. So what is the best thing in a situation like this? The truth or lies? And what do you do if your father ever gets up enough guts to ask you the same question about himself?